Guilds in Godville are different from the ones we have seen in other games. No one owns a guild, not even the founders of the guilds in this game. No one has the power to kick out nor invite anyone. It is a place where gods gather together. However, gods have a very limited interaction with each other in guilds, consisting of a Guild Council and, if desired, a forum thread. Guilds have six main properties: Adventure, Alignment, Unity, Duelery, Popularity and Gold fund. They may also have mottos, emblems and a forum thread. Everything about your guild can be found out by clicking on your guild name which takes you to the guild page. Here, there is a list of all the guild members ranked in order of guild rank (see below) as well as other statistics and a link to the guild's Godwiki article. Guilds with only a single member do not have a guild page, instead a message saying they are not well known and a link to their Godwiki article. 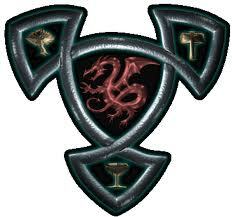 There are a category of pantheons called 'guild pantheons' which rank guilds by some of the properties listed above. You can only join a guild after your hero reaches level 12. To join a guild, send a Voice of god message in this format: join the "<Guild Name>" guild (this works best when your hero is idle outside of town; do not cancel your current quest first). If successful, the hero will embark on a special quest to join the chosen guild but choose wisely because the quest usually takes several days. To create a currently non-existent guild, use the command Create "<Guild Name>" guild. This separate command for creating a guild avoids the creation of duplicate guilds that usually result from misspellings. From time to time, heroes will be given a quest to join another guild. To stop them from doing so, use a command such as abandon your quest if you ever see them on such a quest. Having Popularity in a town is not necessary for any of these benefits nor for that matter is having more than one person in the guild. Small guilds often end up sharing facilities in order to conserve limited resources. The drawback to this is that sometimes newbies from other guilds will have to be pushed back by someone from another guild with a higher rank, which can result in inter-guild hostility. Despite the fact that smaller guilds have smaller benefits, heroes prefer them to larger guilds. As long as a guild has more than five members, a hero will consider joining it, but it is believed that they are more likely to accept a quest to join a guild with lower popularity than a guild with higher popularity, perhaps because they feel sorry for them or because heroes just don't like being popular. 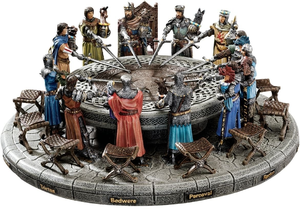 It is known that the higher a hero's guild ranks on the pantheon of unity, the more likely a hero is to accept a quest to change guilds, possibly out of a desire for a quieter place to stay or because heroes just don't like being so close to each other. Guilds with 1-5 members who are too small for other heroes to consider joining. Guilds with ~95 members whose members generate just enough popularity for heroes joining randomly to counter heroes leaving. ↑ The name of this rank is set by the guild leader and therefore varies from guild to guild. It may not exist if it has not been set. Attaining the rank of grand master (although it isn't the topmost one) means that the hero will not try to leave the guild (by randomly starting a guild joining quest). However, if a god does not check on their hero for over 30 days, they will leave the guild regardless of their current rank. Attaining cardinal for the first time will also yield the Careerist 3rd rank achievement (1st rank is achieved from reaching this rank in 3 guilds). For each guild there exists a Guild Council (GC). This is not the same one that members of the guild may have decided on (usually displayed in their guild articles) but is like a 'friend' that can be private messaged, accessed by clicking the button under the 'invite a friend' one button. It acts as a conference chat with all members of the guild able to participate and is therefore a handy alternative for slow forum messaging. However, if there is any trouble, the higher ranked members (i.e. those who have been in the guild longer) may expel lower ranked members from the guild council and a list of currently expelled members can be viewed by clicking on the icon at the top left of the chat window. Also those members are able to impel expelled members back into the council. The expel/impel actions are available to everyone in the guild ranking Cardinal or higher. Most guilds also have a forum page and some even use 3rd party chat services. To list in the GC, you must be at the rank of Recruit or higher. Once a guild has 5 cardinals an election can be held to choose a leader. Any member ranked Hierarch or higher can run for leader and anyone ranked at least Cardinal can vote. The candidate with most votes will be elected leader, providing at least 5 people and 25% of eligible voters have voted for them. The leader is able to set the guild council topic and create the link to the guild's forum page. If the guild has 5 prophets and has reached the top 20 in the pantheon of popularity the leader can set or change the high-level rank for the guild. If the guild has reached the top 20 in the pantheon of duelery or two members ranked cardinal or above have ended the duelling season in the top 100 of the pantheon of duelers, the leader can choose a regular monster to be the guild's totem monster. More info can be found on the Guild Leader godwiki page. This page was last edited on 10 April 2019, at 20:14.